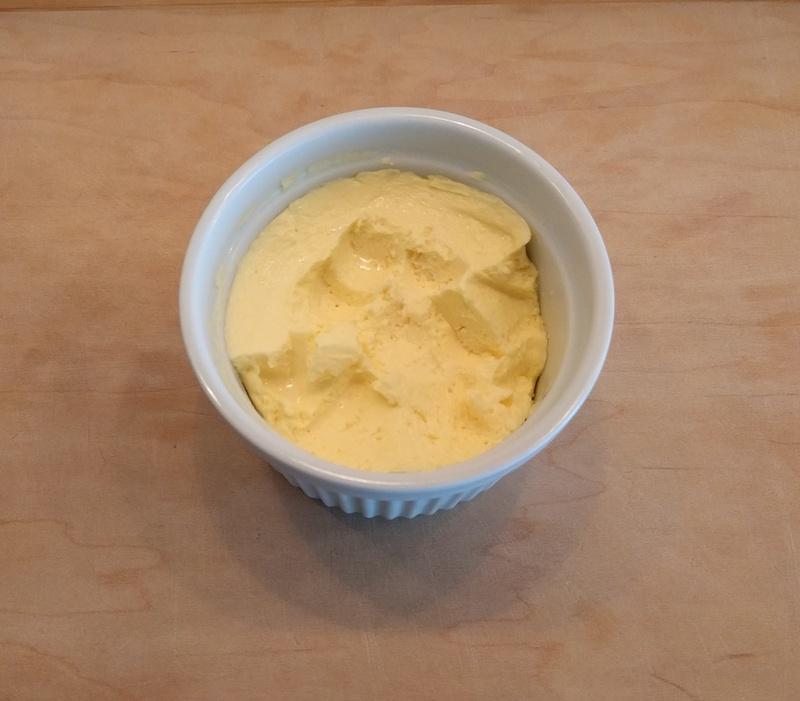 It turns out that it's extremely easy to make butter if you have good quality cream and a food processor - all the churning work is accomplished in minutes, and the result is more creamy and luscious than the storebought stuff, in my opinion. I might just make all my own butter from now on. I've read that certain varieties of commercial heavy cream contain stabilizers to prevent overwhipping in ordinary baking situations. Check the ingredients and avoid this if at all possible - your output is only as good as your input. I use cream from the Straus Family Creamery in Northern California. I have an 11-cup food processor and 520g cream is just the right amount for the liquid fill line. Don't exceed the liquid fill line on your food processor - the quantity can be easily scaled as necessary. Warm the cream to 50-60F. You can still make the butter at higher temperatures, but it will be very soft and difficult to wash.
Add the cream to a food processor, and process until the solids and buttermilk have separated, about 2 minutes. Err on the side of processing more rather than less, as you want to achieve maximum separation. Drain off the buttermilk (reserve if desired), and rinse the butter in the bowl, pressing out excess buttermilk with a spatula. Repeat this process several times. It's quite important to wash out all the buttermilk as it will make the butter go rancid very quickly. Remove the butter to a cutting board or baking tray, form into a ball and gently press out any more excess buttermilk. Fold in the salt, transfer to a container, and keep in the refrigerator.